Getting into the Text, edited by Daniel L. Akin and Thomas Hudgens (Eugene, OR: Pickwick Publications, 2017). 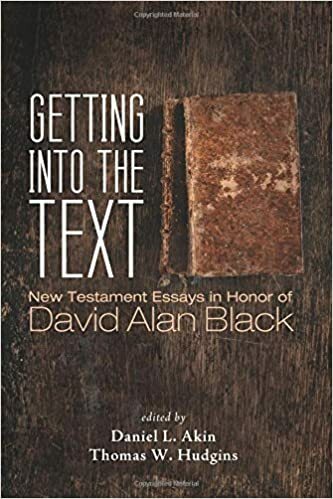 David Alan Black has been one the leading voices in New Testament studies over the last forty years. His contributions to Greek grammar, textual criticism, the Synoptic problem, the authorship of Hebrews, and many more have challenged scholars and students to get into the text of the New Testament like never before and to rethink the status quo based on all the evidence. The present volume consists of thirteen studies, written by some of Black’s colleagues, friends, and former students, on a number of New Testament topics in honor of his successful research and teaching career. Not only do they address issues that have garnered his attention over the years, they also extend the scholarly discussion with up-to-date research and fresh evaluations of the evidence, making this book a valuable contribution in itself to the field that Black has devoted himself to since he began his career. 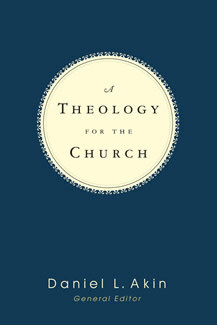 A Theology for the Church (revised), edited by Daniel L. Akin (Nashville: B&H Academic, 2014). With a new introductory chapter on theological method and several other chapters receiving moderate to complete overhauls, this new revised edition of Dr. Akin’s systematic theology text will be a help to everyone from laypersons to students to pastors and scholars. 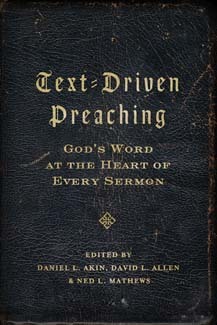 Text-Driven Preaching: God’s Word at the Heart of Every Sermon, edited by Daniel L. Akin, David L. Allen and Ned Mathews (Nashville: B&H Academic, 2010). With essays by some of today’s best expositors, Text-Driven Preaching urges pastors to commit to presenting true expository preaching from the pulpit. This book rests firmly on the biblical and theological foundation for exposition: God has spoken. A Theology for the Church, edited by Daniel L. Akin (Nashville: B&H Academic, 2007). What does Scripture say? What has the church believed? How do various doctrines fit together? What impact do they have on today’s church? Addressing these crucial questions, Daniel Akin, Albert Mohler, Paige Patterson, and other leading Baptists examine systematic theology in way that will be informative and edifying for everyone from seminary students to pastors to laymen.